B) It’s ready immediately after mixing the ingredients together. No more waiting for lime juice to slowly cook your seafood. 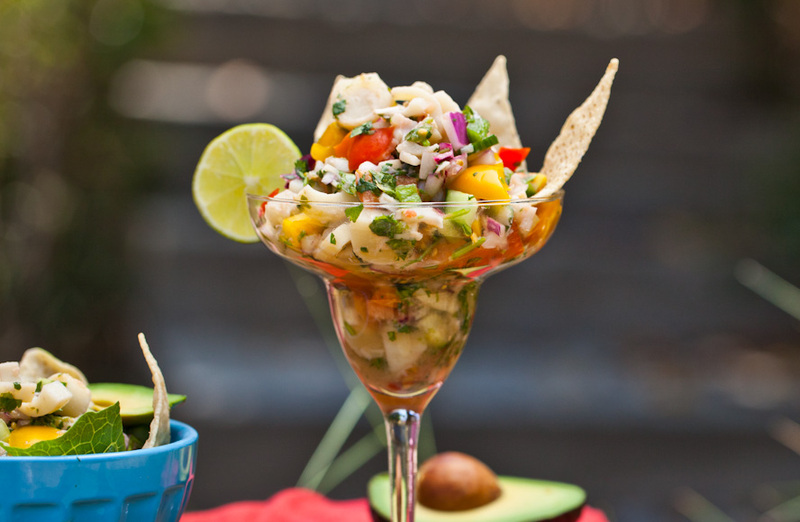 This hearts of palm ceviche is ready to be instantly and excitedly devoured. Eat it with chips, salad, or straight out of the bowl with a spoon. C) Seafood is expensive! Hearts of palm isn’t the cheapest vegetable on the market, but it is quite a bit more affordable than quality scallops and shrimp. Check this ingredients list, it’s so simple! I made the recipe for a crowd. It serves 4-5 as a main dish salad or 8-10 as an appetizer. I am completely obsessed with this Vegan hearts of palm ceviche recipe. I’ve made it four times just in the last week! I can’t get over how fresh and simple it is. While not entirely raw, it’s pretty close. I adore the rainbow colors too. It’s pretty AND delicious. Who can argue against that? Light flavorful and filling! Vegan hearts of palm ceviche that's ready in only 15 minutes. Drain the water from the hearts of palm and chop it into large chunks. In a medium bowl combine the hearts of palm with the remaining ingredients. Deseed the avocados and slice them into large chunks. Stir the avocado into the hearts of palm ceviche. Enjoy with chips or as a salad. Did you make this Vegan hearts of palm ceviche? Leave us a comment and tell us about it! While you’re at it, post a photo to Instagram with the tag #carrotsandflowers so we can admire your summertime snack! It will make our day! For more simple summer recipes, be sure to check out our Raw Gazpacho in Bell Pepper Bowls and our Portobello Fajitas with Easy Guacamole. If you haven’t tried this hearts of palm ceviche but want to save the recipe for later, pin the photo below! Yum! What a perfect summer recipe! 🙂 🙂 🙂 Thanks Josie!! This looks amazing!! I can’t wait to try it this summer! Hey Stephanie! Just saw this comment, sorry for the delayed reply. Hope you tried the recipe and loved it! OOOO YUMMY! I love hearts of palm but always just end up eating them straight out of the jar/can. Can’t wait to try this and use them in a better way :)! Awww….this looks so deliciously tasty. Can’t wait to try it. I LOVE quick recipes that include lots of color. I shared this with my FB group “Super Quick Plant-Based Recipes” https://www.facebook.com/SuperQuickPBRecipes/ I am sure they will enjoy your site when they come over to check out this scrumptious recipe. Thank you! So I made this for a dinner party last month with a few substitutions. I don’t like red onion, so I subbed a bit of onion powder to taste, omitted the bellpepper and also halved the recipe since there weren’t so many of us and there were several other side dishes. I had NONE leftover and even had a particularly picky-eater friend ask for the recipe. Next time I will probably add a bit of chopped cabbage. With that said, I love this dish! I made this for Mothers Day. Followed the recipe exactly and served it with tortilla chips. Everyone loved it. Thanks for the yummy recipe. I’m looked my forward to trying more. This. Was. Sublime. I paired it wth your 20 minute quesadillas for a Fourth of July grill-free supper (it’s 95 degrees!!!) Perfection! I’ve made this twice now. Who needs chips? I just eat it by the spoonful. I can’t help it!! GREAT recipe! I Loved it and so did my coworkers! We have made this recipe many times and it is excellent. Today we made it to take to a birthday party. I had overlooked the jalepenos, but we poured in some brine from a jar of jalepeno pickles. It was really good! Not up to the fresh, chopped peppers, but useful in a pinch. Thanks so much for this awesome recipe. I have missed the ceviche I used to eat with the sturgeon in it. I think this is much better! We made this for Valentine’s Day; it is soooooo good! So healthy, filling and tasty that I’ve sent this link to everyone this morning. We made it with hearts of palm medallions because those were a lot cheaper at Trader Joe’s. I’ll probably try it with the regular ones next time (because variety is the spice of life), but the medallions were still A+. I’ve made this a few times already and it’s a no brainer for anyone looking for a vegan ceviche alternative. It has lots of flavor and the texture of the hearts of palm is as close as you’ll get to fish. And as mentioned in the post, it’s great not having to wait for anything to cook. All you have to do is chop everything and toss it together. I love putting it on tostadas and topping it with some habanero sauce. Omg! Absolutely obsessed with this. we have made it 2 weekends in a row!